Here is a photograph of the custom order pendant that I made. 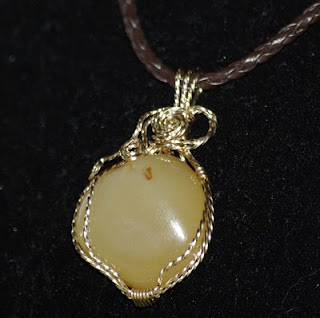 The customer brought in a stone and wanted it wrapped in a 14k gold filled wire design. The stone is really thick on one side and gives it kind of a unique look; I brought the wire up on the sides as a wire basket support. I also made her a ring that I'm not quite finished yet. I need to put the finishing touches. I'll be posting a picture later.